Seriously, meat simply does taste (even) better with a touch of oak smoke. How I wish I had a garden! Among the amazing smoke ringed creations from this weekend, these loaded torpedos (literally!) injected some silliness to the proceedings. Got to love the name of this dish: Atomic Buffalo Turds, or "ABT" for short. This seems to be a pretty common side dish in BBQ circles, but here is a slightly different take on it. I'll call it the Franco-Swedish variation. Not only are they as tasty as they are different, they also have a lovely paleo feel. First a word on the actual chillis used. The peppers used weren't strictly jalapeno peppers, any longish chilli peppers with a decent amount of heat will do. The ones Anders used were about 15cm long. I'll probably struggle to find fresh chilli peppers suitable for this here in the UK, so I intend to try this with smallish romano peppers and instead add some chilli sauce to create the kick. Squeeze some honey in each pepper, perhaps 1/2 to 1 teaspoon, then fill the cavity with Camembert cheese. Don't overstuff it, you want to be able to seal it up when wrapping the bacon. 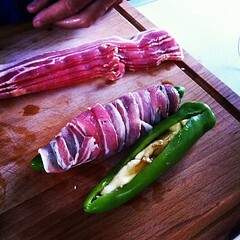 Use enough bacon rashers to wrap the length of the chilli, for ours (15cm) Anders ended up using 3 rashers each. Wrap them tight enough to close up the cavity, so you don't get Camembert leakage as the cheese melts. Sprinkle with freshly crushed black peppercorns, and grill until the bacon is done and the chilli has softened. Serve the turds on their own with a cooling salad, or as a side dish to a great piece of meat. Add loads of beer, but I think that goes without saying.